Location: Diamonds Head private estate on the beach. 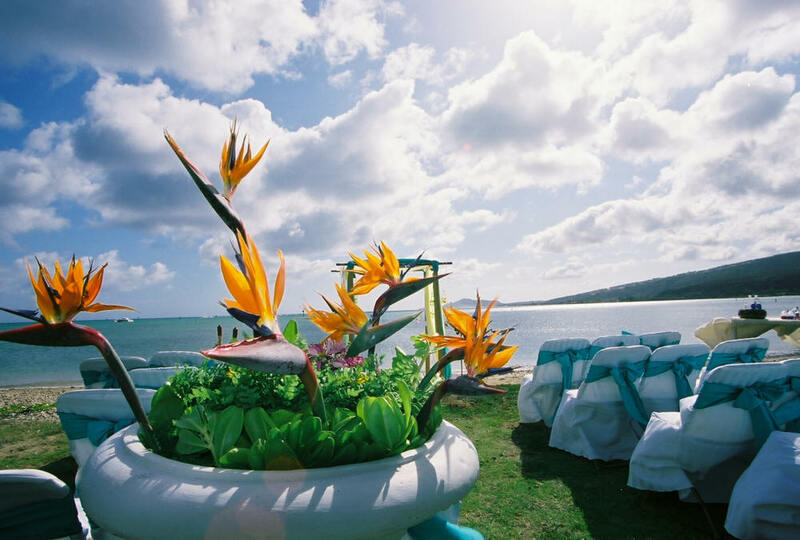 Wedding site: Grassy backyard by the beach. iPod was used for the Bride's Grand Entrance. Other than that, I'd like the Harpist to play music including the Procession and the ceremony. Harpist. Something slow, peaceful and relaxing. Bride, Groom, 3 mothers, 3 fathers, 2 bridesmaids, 2 groomsmen, 1 sister and 1 brother. We will be in town on May 7. A white arch decorated like shown in the above picture, except that I would like to have a white flower center bouquet instead of orange/yellow. I definitely like the center large bouquet idea. (something Rev Chris probably needs to know about). And translation will be taken directly from his script. Before the ceremony, we�ll have our iPod play the traditional wedding music while close family enter the site and the big entrance for the bride. The musician can take over after the ceremony begins. We�d like the hula dancers to show up around 6:30pm (1 hr after the beginning of the ceremony) and entertain guests for 1 hour. What is the normal cost for fire dancer? yes the chairs will have your choice of flower. Does the photographer do digital photos? yes there will be digital plus film. How long does the photographer normally stay at the wedding? i recommend pre wedding photos in the house.